As equity markets remain volatile, futures markets are reaching new volume records. In 2015, CME Group open interest was up 5%, while Q1 2016 volumes on E-mini S&P 500 futures were up 31% year-over-year, as shown in Fig.1. Both futures and ETF markets have shown impressive growth, though the growth of the ETF market has not come at the expense of futures, according to Tim McCourt, CME Group’s managing director and global head of equity products. “ETFs have taken market share away from mutual funds, not from futures, with index tracking mutual funds having seen $170bn of outflows between 2013 and 2015,” McCourt says. Every basis point counts with passive index investing; this belief was a driving force behind CME Group’s The Big Picture: A Cost Comparison of Futures and ETFs, updated to reflect 2015 data and available to readers as an insert in our hard copy magazine or via a link on our website. This report provides an analytical framework for comparing the costs of trading or investing in the S&P 500 equity index via E-mini S&P 500 futures and the three largest S&P 500 ETFs (SPY, IVV and VOO), for different types of investment strategies, investor types and holding periods. The analysis is based on a range of assumptions that CME Group enumerates as typical for many larger investors. The second edition of The Big Picture report is based on data from the second half of 2015, which strengthens the case for using futures over ETFs. Previously, when roll costs were elevated, futures were more cost effective than ETFs in seven out of eight investment scenarios – shorter-term and longer-term holding for international investors, short sellers, leveraged and fully-funded investors; ETFs were only found to be cheaper for fully-funded investors with longer holding positions, according to CME Group’s analysis. “Here, the higher roll costs were pivotal and data shows that futures are, hands down, the cheaper and more liquid product choice,” McCourt said. Using second half of 2015 roll cost conditions, though, the latest report shows futures are more cost efficient across all scenarios. For short sellers and leveraged investors, prime broker financing costs make futures even more cost efficient, while dividend withholding taxes can strengthen the case for futures among international investors; for fully-funded investors, futures have become a more cost-efficient choice, irrespective of holding period, according to the report. The cheapening of the roll cost, or implied financing cost embedded in futures, is crucial to analysing the costs of futures versus ETFs. In the second half of 2015, the futures roll dropped from 20 basis points above to approximately 6 basis points below LIBOR, meaning that futures could be between 12 and 15 basis points cheaper than ETFs, according to CME Group’s analysis. Even when roll costs have been above LIBOR, they still may not outweigh the cumulative impact of management fees on ETFs, McCourt said. “Even when the futures roll is rich, it can still be better to use futures than ETFs, and when the roll is cheap, it is overwhelmingly better to use futures,” McCourt said. Since The Big Picture was released in early February 2016, roll costs have fallen further to around minus 28 basis points, the lowest levels since 2009, as shown in Fig.2. This continued cheapening of the futures roll means that futures now could cost 40 basis points less than ETFs for fully-funded, long-term investors. Why has the roll cheapened so dramatically? 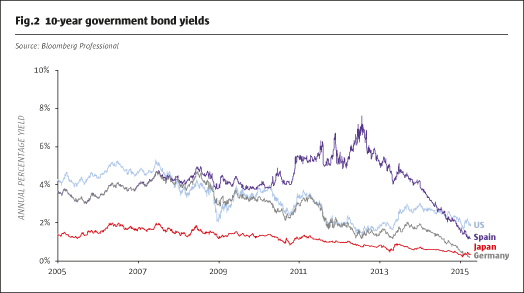 While risk-free/benchmark interest rates are one component of futures pricing, they are different from the all-in implied financing of the roll; roll costs are a function of the spread to the interest rate, not a function of the benchmark interest rate, which unilaterally impacts all investment vehicles. 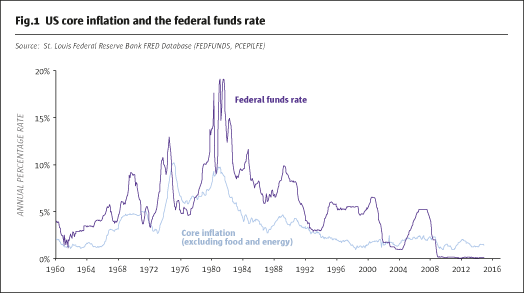 Recent or future interest rate policy will not automatically impact the cheapness or richness of the roll, which may change the cost of capital for certain customers, making futures at historically cheap levels even more attractive. Recently, some ETF providers have argued that higher capital requirements combined with other constraints on US sell-side banks, have contributed to increased roll yields, but the CFTC Commitment of Traders report contradicts this theory. In hindsight, the elevated roll costs of 2012 and 2013 may be viewed as a temporary or cyclical phenomenon rather than any structural shift. The relative cheapness of equities in 2015, combined with the recent heightened volatility have attracted more short side participants, “bringing the market back into equilibrium versus its usual long bias,” according to McCourt. The liquidity differential between futures and ETF markets also impacts the cost analysis. One key assumption in The Big Picture, that a $100 million trade entails one tick (or 1.25 basis points) of market impact for futures, and up to twice as much more for ETFs, is based partly on the huge liquidity differential between futures and ETFs. For many non-US investors, futures can remain cheaper than ETFs, even when roll yields are rich, due to withholding taxes (WHT) on dividend income. Investors may try to reduce or avoid WHT through means, such as double taxation treaties (DTTs), swaps or other synthetic structures. And while rule 871(m) can apply WHT to synthetic structures around single stocks, equity index futures have a qualified index safe harbor from rule 871(m). If investors cannot fully eliminate WHT, ETFs will typically be subject to a WHT of up to 30%, which can cut returns by up to 70 basis points, according to McCourt. By way of comparison, where a DTT cuts WHT to 10%, this still eats into annual returns by over 20 basis points per year. Futures, by comparison, do not pay dividends, so there is nothing to withhold. Expected dividend income is, instead, factored into the futures price. WHT is not a benefit for short stock sellers, as the market convention is for short sellers to bear the cost of gross dividends. While CME Group does not give tax advice, The Big Picture highlights that for taxable US investors, E-mini S&P 500 Index futures can be relatively tax efficient as a Section 1256 contract, because 60% of gains are treated as long-term capital gains, taxed at a lower rate than the 40% of gains treated as short-term capital gains. In contrast, shorter-term ETF trades would be treated entirely as short term gains, which is pernicious for some market participants when shorter term trades are often used to manage inflows and outflows and for portfolio rebalancing and cash equitisation, rather than intentional short-term trading; tax treatment effectively sets a higher hurdle rate for roll yields before futures become more expensive, according to CME Group’s report. For Jack Hansen, chief investment officer at Parametric-Minneapolis Investment Center, the flexibility and cost efficiency of futures, helps him better serve the firm’s clients. Separate from dividend taxation, equity index futures may also serve as one way to manage dividend risk – through the use of dividend index futures. Investors are currently cautious on the outlook for equity dividends, with flat dividend futures for several years out and specific concerns about the energy sector, McCourt said. Equity index futures lock in a fixed level of dividends over the relevant holding period, whereas ETFs will pay out actual dividends received that may be lower or higher than forecasts embedded in futures. Whereas roll yields ebb and flow with market dynamics, ETF management fees may diminish returns. “Management fees are always an inherent drag on performance that diminish returns as a persistent function of product design,” McCourt said. Sabrina Callin, managing director and StocksPlus product manager at PIMCO, says that the comparatively lower initial margin of futures contributes to the ability to outperform equity markets. While the debate over the cost efficiency of futures versus ETFs has largely centered on the S&P 500, the framework set forth in The Big Picture does allow investors to extrapolate the costs for other indices. The cheapening of the futures roll, which has been favorable for S&P 500 futures, is also making E-mini NASDAQ-100 and E-mini Dow ($5) cheaper than their corresponding ETFs. While major index futures are showing to be cost efficient on their own, margin offsets among futures can be as high as 90% and cross-margin agreements with other exchanges, like CBOE. Because margin requirements on equity index futures can be as low as 4.6% (as of early 2016), margin offsets also free up cash available to post initial variation margin on currency hedges, leading to additional cost savings.